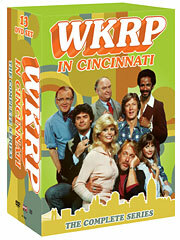 Cult classic sitcom “WKRP in Cincinnati,” now making its complete series DVD debut, takes viewers to a much different time – a time before iPods and Sirius, when AM radio was still a very real thing that people listened to and relied on for news and entertainment. Yes, radio once upon a time had character, and helped dictate and define our culture, pop and otherwise. Running for four seasons on CBS, from 1978 to ‘82 – a time of major transition in America – “WKRP” was a wacky workplace comedy that helped pave the way for shows like “The Office,” “30 Rock” and “Parks and Recreation” today. To discuss what makes the series tick, one must first understand its lunatic cast of characters, who are at the root of every episode, every laugh and every plot development. There are eight principles that can be broken down into three categories. Management: Arthur Carlson (Gordon Jump) is WKRP’s sometimes bumbling but always good-hearted station manager, also known affectionately as “The Big Guy.” Though from time to time he appears to possess a modicum of business acumen, for the most part, he’d rather not be bothered with the day-to-day operations of the station, instead focusing on his hobbies, which include fishing and model trains. The series kicks off with Carlson’s hiring of Andy Travis (Gary Sandy) as the station’s new program director. The level-headed center of the bunch, Travis has been living town to town, up and down the dial, and doesn’t see WKRP as anything more than another stop in his career of rebranding stations and making them profitable. Soon enough, he’ll discover there’s something special about this station that keeps him from moving on to the next one. Jennifer Marlowe (Loni Anderson), Carlson’s bombshell-with-brains secretary, shouldn’t technically fit under management, and yet as the series progresses, it becomes all too clear that without the glue that is Jennifer, the entire enterprise would fall to pieces. The Disc Jockeys: Dr. Johnny Fever (Howard Hesseman) is the station’s morning drive man. Like Travis, Johnny’s worked at more stations than he can remember, though that may have more to do with years of drug and alcohol use, which is more hinted at than ever explored. Fever is the show’s wild card, and “WKRP” never shies away from throwing bizarre, unpredictable plotlines in his path. Venus Flytrap (Tim Reid) is Andy’s first move upon changing the station’s format to rock and roll, hiring the jock “away from a station in New Orleans.” Shrouded in a mysterious past, Venus takes care of the evening shift, playing soothing, laid-back tunes for the greater Cincinnati area. “WKRP” peels away the Venus onion, giving him a little more backstory every season, and one of the show’s very last episodes (“The Creation of Venus”) brilliantly redefines his introduction way back in the two-part pilot.